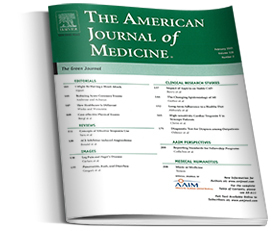 The American Journal of Medicine “The Green Journal” – publishes original clinical research of interest to physicians in internal medicine, both in academia and community-based practice. This publication is the official journal of Alliance for Academic Internal Medicine, a prestigious group comprised of chairs of departments of internal medicine at more than 125 medical schools across the country. Almost 90% of AJM subscribers are board certified in internal medicine. Each issue carries useful reviews as well as seminal articles of immediate interest to the practicing physician, including peer-reviewed, original scientific studies that have direct clinical significance, and position papers on health care issues, medical education, and public policy.